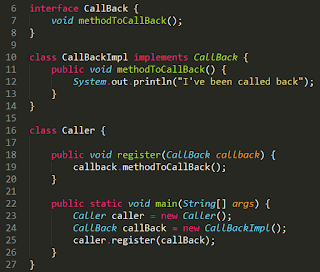 Simplified Callback pattern in Java just to understand it. Concrete example follows bellow. Ok you may be asking you, when this usefull or may be asking you what's the difference between calling directly callback.methodToCallBack() right? ANSWER: well, this example just shows to you how to construct such a callBack function when working in a java environment. Certainlly it doesn't make it any sense to use it that way. Let's get a little deeper into a concrete useful example now. The idea behind it is the "INVERSION OF CONTROL". Let's take a timer as a realistic example. 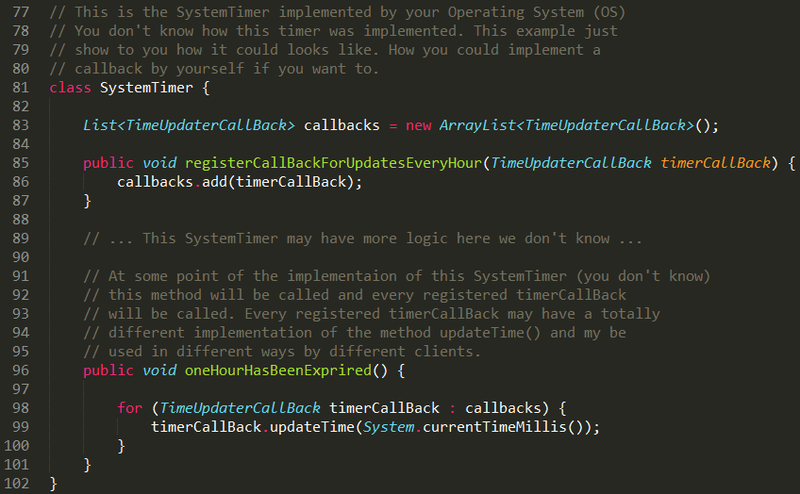 Let's supose that you know, that a specific timer supports callback functions every hour. Exactly it means, that every hour, the timer will call your registed call method function. // this is your implementation. // callback by yourself if you want to. // used in different ways by different clients. // the website's time every hour. What is the theme you are using in eclipse? Hi! i like it too and i'm trying to create something similar to that in eclipse. I'm using sublime text. as soon as i have something like that, i'll be sending to you ok. It is Sublime 2 or 3 its free to use or you can buy a license. That doesn't seems like eclipse - that's probably QT. It is Sublime Text 2 or 3. It's free of charge in their site. I'm not understanding how your example this is anymore concrete than the original example you pasted that appears everywhere else on the internet. Then, you could say, for a newbie, that a callback is a kind of listener for OS calls? 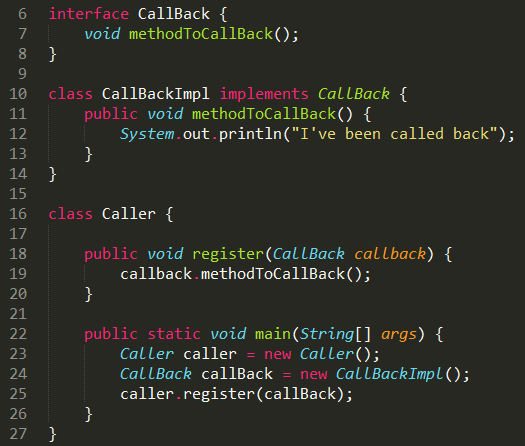 Thank you it helped me, but I did't get this, the callback is excecute automatically?if I'm right, when does it happen? 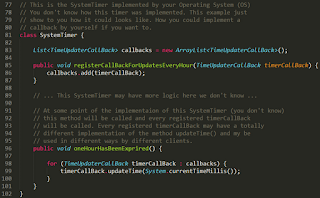 Perfect post, just what I needed, I did't get that, when is execute the callback?? What purpose of function oneHourHasBeenExprired(). I see it never used? Highly informative article shared by you. I appreciate the way you convert your thoughts into words and write such compelling details keeping the content compact. Thank you for the share.